Did you ever have something really hard or bad happen in your life, and maybe you were super worried or stressed about it, but once you had a plan you felt better? You still have to deal with it and go through all the pain or hassle, but having a plan makes you feel like you're being proactive. Plans in the garden make me feel better too. I'm still going to have to deal with plants dying or growing slowly or not growing the way the tag said they would, but I have a plan. In the northeast corner of the yard, the corner we stare at all through winter while we drink coffee in bed, I finally gave up on the Cryptomeria japonica 'Elegans'. It couldn't stand on its own for whatever reason (I think that corner is just too windy). This corner has been a mishmash of stuff, mostly natives that I got on the cheap because I was so cash poor when I first bought my house. Behind the cryptomeria was an Ocean Spray (Holodiscus discolor) that looked absolutely terrible all the time and it had no winter interest. It was also going to crowd out that tree eventually. Between the weeping blue spruce and the cryptomeria is a huckleberry that is going to take a million years to get up to a good shrubby size. I'm willing to wait on that one because it's evergreen and very pretty. There used to be a native flowering currant in that spot but the pink blooms clashed with everything else so I dug it up and gave it away. While we're on the subject of natives, I planted a nodding onion here on a whim and I will be forever pulling up seedlings as a result. Except the seedlings have to be dug up, they're so stubborn. Worst native ever. The cryptomeria is going to be replaced by a Korean fir but I've yet to find one with a form I like. I ripped out the Ocean Spray this weekend. To get some height and winter interest in this area I'm finally getting smart and incorporating tall grasses and fast-growing perennials. Behold, my amazing MS Paint skills! Two Panicum 'Northwind' will lend some height in the back, along with Joe Pye weed. I'm planning to put in some Zauschneria starts to obscure the tulip foliage once they start dying. I'm really excited about the lupine here, Lupinus regalis 'Thomas Church,' which Annie Hayes described in a lecture I attended last spring. Its blooms are two toned purple and yellow and it's fragrant and (supposedly) mildew-free. Just to the left lies the apple tree stump that I attempted to turn into a birdbath. The birdbath couldn't hold water after the second year and the stump keeps suckering along the root line, so I've yanked out all the peonies and penstemon from this area and the stump will be ground out in two weeks. 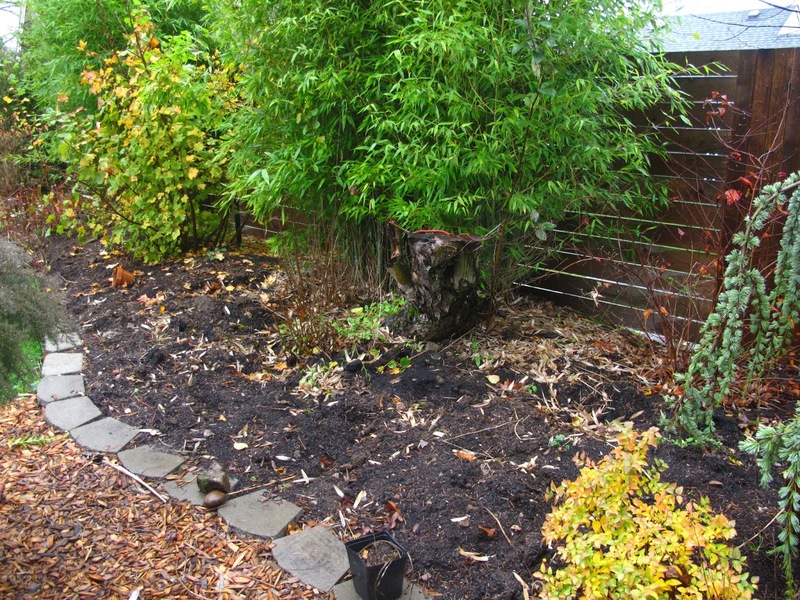 The peonies have been permanently relocated to another area of the yard and soon I'll have a blank slate in front of the bamboo. I don't have a plan for this area yet. I want to plant a gunnera but I'm worried it will dwarf the ninebark to the right of the bamboo. I'm also worried it won't fit in a yard where there isn't much in the way of tropical plants. I have about 50 square feet of blank slate here. I think I might need another Melianthus major but that's all I've got so far. Anybody have good ideas? Has anyone ever crowd sourced their yard as much as I have? I don't think so. I like posts like this, where you (or a blogger) talk about what did and didn't work. 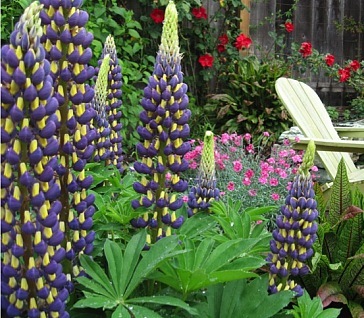 Thanks for mentioning the lupine - I love them but have had a hard time keeping them alive. Maybe I'll give this one a try! I'm keeping my fingers crossed for this one--I killed FOUR lupines last year. For being native to this area that seems really fussy. It's amazing that you seemed to be reading my mind about your backyard. I remember you posting earlier about feeling it necessary to have more plants with BIG leaves. I won't say you shouldn't add in a few of those (I know it's particularly au courant), but, honestly, I thought at the time...it's not so much that you only have plants with small leaves, it's more that you need bigger groupings of those same plants to make an impact. 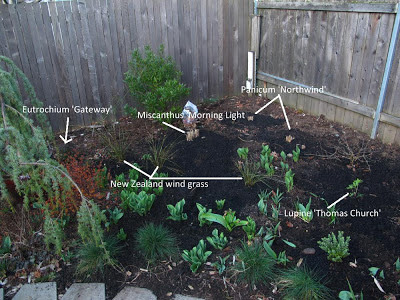 To that end, I'd love to see you really do larger groupings of things...perhaps a drift of 3-5 Bouteloua (or similar-size grass, like Molinia variegata), for texture, several Eupatorium 'Chocolate' for dark foliage contrast, and your Melianthus. Those things are all in the 2-4' range…so then I'd punctuate the groupings with scattered patches of something tall and airy…perhaps Verbena bonariensis (unless you don't like purple), then, perhaps something like Patrinia or Sanguisorbia…even Knautia would be good to break up the blockiness of the other plant groupings and give that air of spontaneity. Oh…and I can't remember if you like Lilies…but LILIES…tall, fragrant ones! As far as Gunnera goes…in the right setting, I love them, don't get me wrong, but I agree with you..I think it would be out of scale…and just wouldn't "sit comfortably" in your garden. Plus, they are unbelievably thirsty plants. For a similar (if slightly more subtle) effect, I'd go with Darmera, which still gives you bold foliage, but at a smaller scale…and you get the bonus of good fall color. I could ramble on forever…especially since I'm re-thinking parts of my garden this year…and this keeps me from obsessing about my own mess…sigh. You're the best--we should go shopping! I like all of these ideas. I've already ordered a bunch of Blonde Ambition for the entrance to the yard. I LOVE that grass. And who doesn't love lilies? I have some planted here but I couldn't find them when I pulled everything out. I'm hoping they don't get ground down along with the stump. :( Thank you for helping with my yard . . . again. I like your intelligent approach to design, and I try...I really do...but seat-of-the-pants will, alas, always be my "style", for lack of a better word. It will be fun to watch this corner develop. As you know, I love Joe Pye Weed. I'm sure you'll be happy with this plant, and also the switchgrass. Consider Sweet Joe Pye Weed (E. purpureum). It takes some shade and needs less moisture, also very tall. Ah, this is so good to know! Thank you!